World O' Crap: Operation Afreet is Afoot! If you've been following the comments to Hank Parmer's latest post (a study of P-51 Dragon Fighter, which is, I daresay, a far more exhaustive review than the filmmakers ever expected to receive, and every bit as snarky as they deserve), then you've learned much about Poul Anderson's Operation Chaos, a series of novellas which shares a superficial similarity to P-51 (dragons, witches, and other magical beasts doing their patriotic duty in World War II), and our friend Li'l Innocent's efforts to translate the tale into sequential art. I found a scan of the 1950-something Fantasy & Science Fiction cover that Frank Kelly Freas did to illustrate Operation Afreet. It's almost abstract, and yet - in its ​SFish way - in the grand mid-century pinup tradition. There's no justification in Anderson's text for the lady's outfit! But I remember as a 12 year old grooving on the magazine, that the magical elements of the art fascinated me as much as the glamour aspects. Such a cool pictorial narrative teaser! 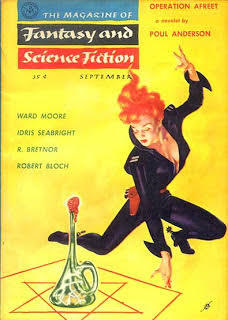 I did a bit of research on Freas and was interested to learn that as a kid in his early 20s, he was an Army Air Force reconnaissance photographer in the Pacific Theater in WW2 -- and also painted pinups on bomber noses. Anyway, I thought you and Hank might enjoy seeing this, in more ways than one! I've dug out the presentation (book size) versions of my Operation Chaos pgs. Will take a bit o' scanning to reduce them to blog-postable jpgs. I'll let you know when they're on my Lady's Mantle blog. Personally, I can't wait to see the images, and I'll post links as soon as they're up. Nothing edifying to add to what Scott's already said, except to note how much I missed by being mostly acquainted with Freas through his somewhat more restrained paperback covers. Kelly Freas was also a prolific illustrator for MAD magazine,second only to Don Martin in my ranking of that magazine's artists for the enduring images burned into my young brain.